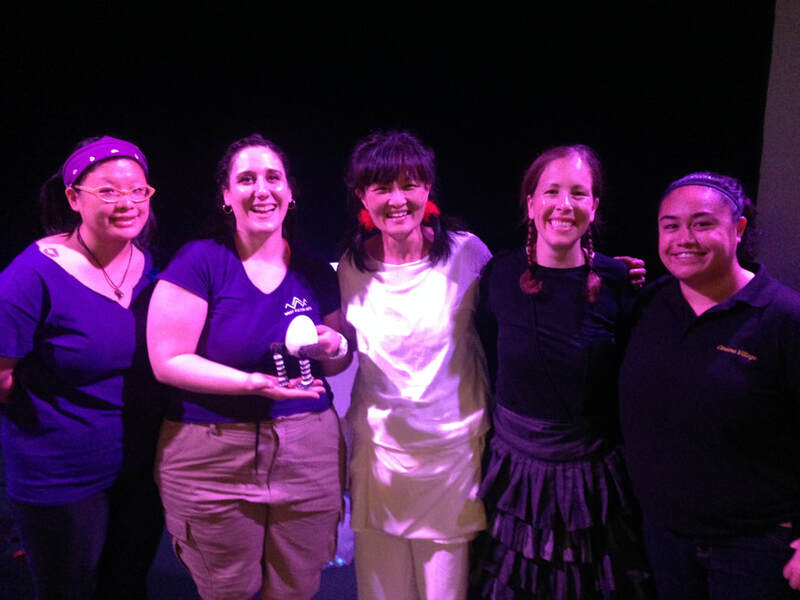 The West Fulton Puppetry Festival is celebrating their 3rd year and Double Image Theater Lab was very excited to take part. This two-day event is packed welcoming families and individuals from across the region to partake in a creative variety of fabulous puppet productions. 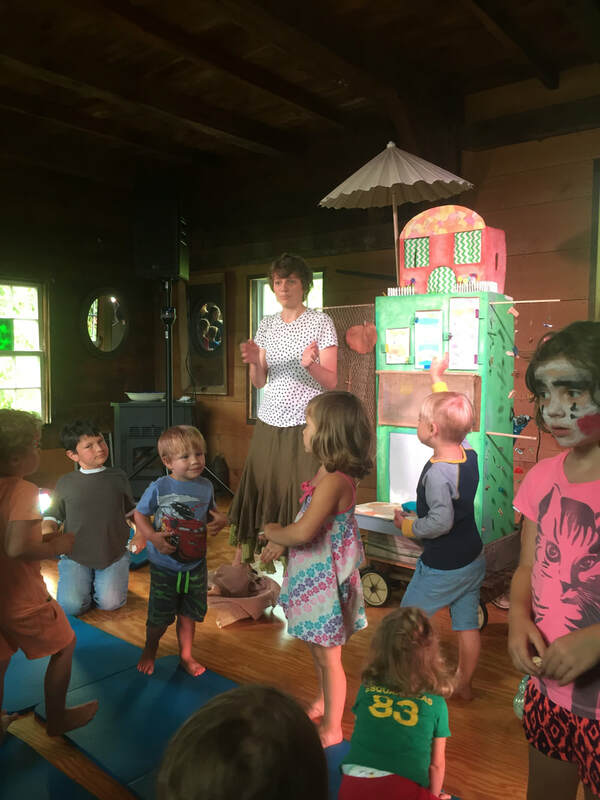 The festival utilizes non-traditional spaces, including barns, a historic schoolhouse, a local arts center and a circus tent! The Festival began with a community potluck and opened with our performance of "I Laid an Egg." The audiences were so generous and filled with laughter. Each audience member wanted to meet the EGG after the show. 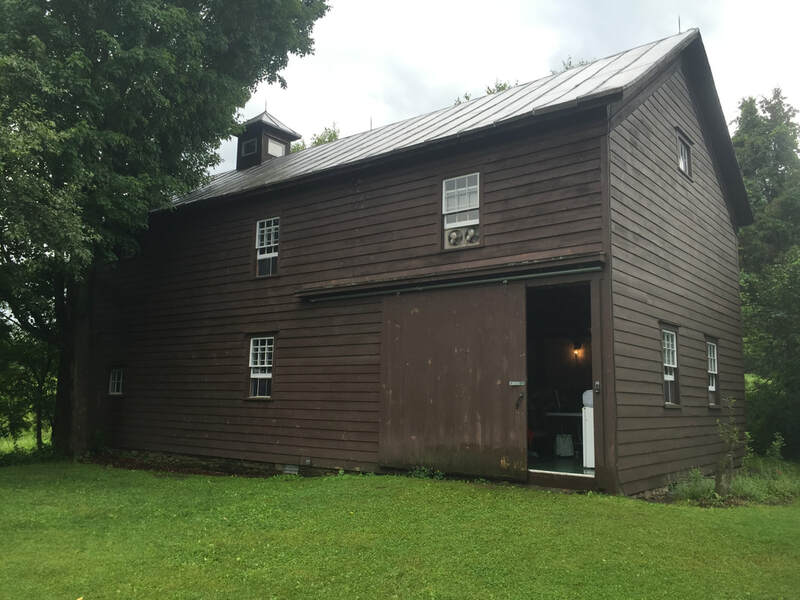 We were grateful to be performing in a beautiful brown barn where the staff was extremely welcoming and helpful. It was such a beautiful space! 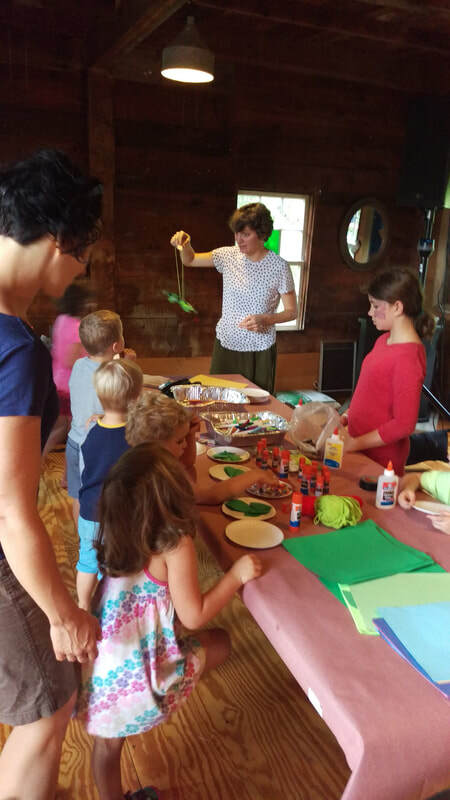 In addition to the scheduled programming for families, there were workshops, crafts, live music and a special added performance for adults on Saturday evening: the U.S Premiere of Andy Gaukel's Schweinehund. We were so grateful to the generous and enthusiastic volunteers, production crew and staff of the festival. 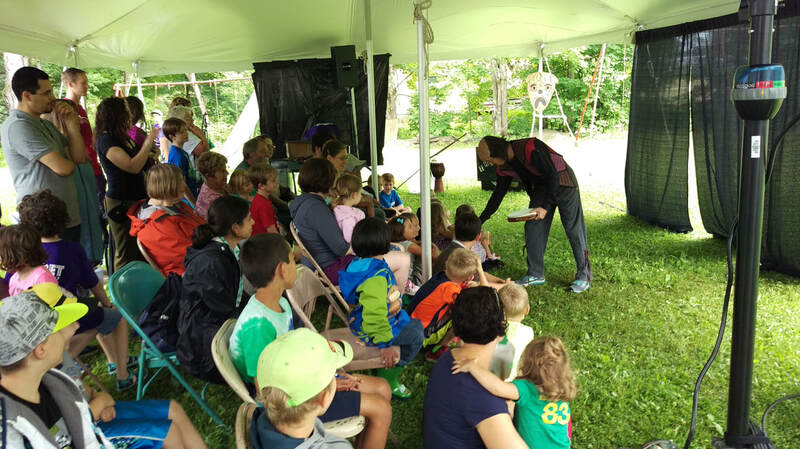 The entire festival was produced by West Fulton Arts--a local non-profit whose mission is to encourage arts participation and engagement throughout Schoharie County and beyond. For more information about the West Fulton Arts and how you can make a donation, please visit: www.westfultonarts.org. Thank you again West Fulton! We hope we can come back and perform again! Double Image Theater Lab brings their new show, "Pousette and the Pirates" to Virginia. The puppetry production of “Pousette and the Pirates” docked at The Charterhouse School and performed June 4th for the elementary school students. 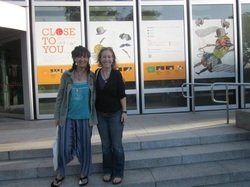 Puppetry Artist Margot Fitzsimmons, receiving her Masters in Fine Arts from the University of Hawaii at Manoa in Theater for Young Audiences with a concentration in Puppetry, collaborated with Charterhouse School’s art teacher Rachel Fitzsimmons to create an interactive residency experience. 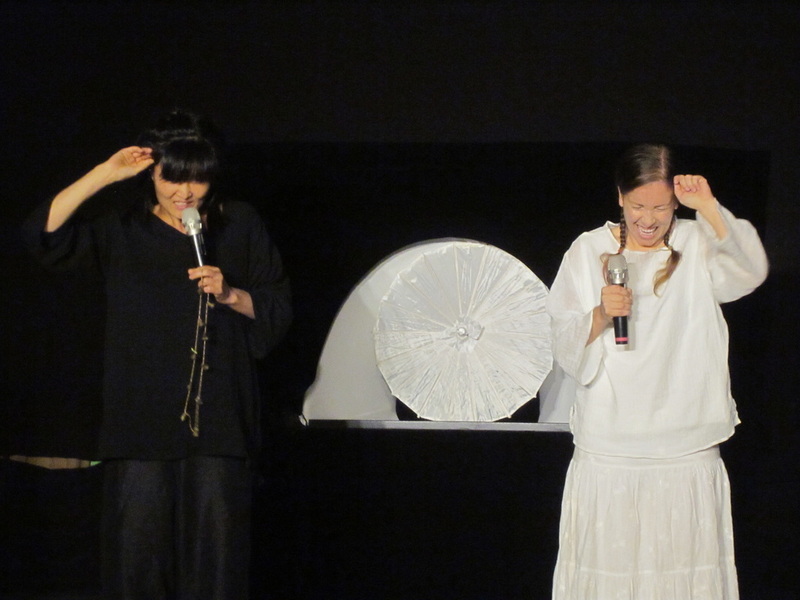 The residency consisted of four pre-show workshops and a performance. Through the workshops, the students familiarize themselves with the performance by introducing them to the characters, the story and the aesthetic of the piece. The workshops began and ended with a ritual. They greeted and said goodbye to Pousette the puppet by singing her song “Yo ho Yo ho a pirate’s life for me.” Margot and Rachel used this ritual as a classroom management tool and it was also an element of the show. The first workshop introduced Margot. She began by asking the class, “what is a puppet?” The students then created their own paperbag puppets and got to meet the main puppet character from the show named Pousette. The set and puppets in the production are entirely made out of newspaper. To familiarize the students with the aesthetic of the show, Margot and Rachel brought in a huge stack of newspapers. 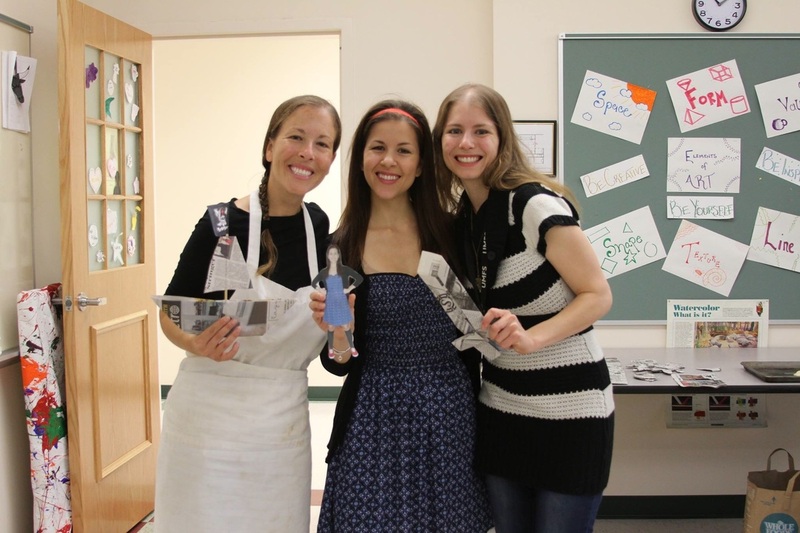 Out of newspaper, the students created objects from the show like pirate hats, swords, and ships. They also constructed objects unrelated to the show such as dragons and crowns. The following day Margot and Rachel brought flour and yeast into the classroom. In the story of Pousette and the Pirates she makes donuts that are filled with too much yeast, and after the pirates eat the donuts they float away. As a class, they created dough and then each received a piece of dough to create their own donut. The day before the show, Margot and Rachel told the story of Pousette and the Pirates while, from their chairs, the students acted out the elements from the piece. The students made the sounds of the wind, ocean waves and pretended to be pirates. Familiarizing the students with the show, allowed them to interact and discuss the themes from the story. The following day the production debuted--with a few surprises. The day of the show, the students connected with the moments in the piece previously experienced in the workshops. The students were extremely engaged when the life size version of Pousette jumped out from under the table and introduced herself to the audience. The class had only been familiar with the puppet version of Pousette, but when she actually entered the classroom, it was as if they met a celebrity. They loved seeing Pousette creating dough right in front of them and watching the puppet version of the Pirates float away. One of the students humorously exclaimed as they floated away, “They are flying yeast!” It was a magical experience. Seeing a show can have great impact. However, when the artistry goes beyond the performance and into the classroom, the students engage with the story in a hands-on, interactive way. It not only prepares them for the performance, it also gives them communication and critical thinking skills. An example of how this residency encouraged creativity, a student created a paper ship independently after one of the workshops. One hopes that the combination of workshops and performance will enhance the students’ theatrical experience and encourage creativity. 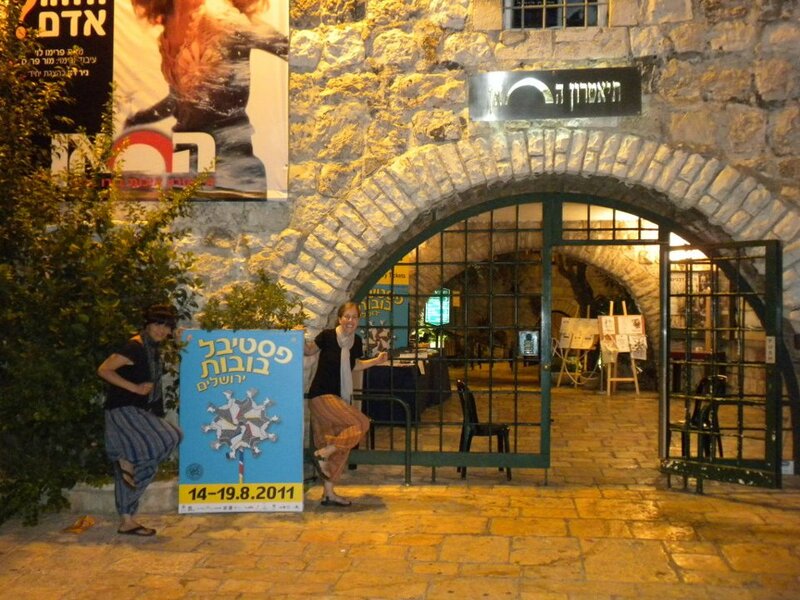 Over a year ago when Spica and I heard that we might have the opportunity to perform in The International Festival of Puppet Theater Jerusalem 2011 we started jumping up and down. “Pinch me!” Spica said. “Is this really real?” It turned out to be a dream come true. August 13, 2011 we boarded a plane and embarked on an incredible journey. 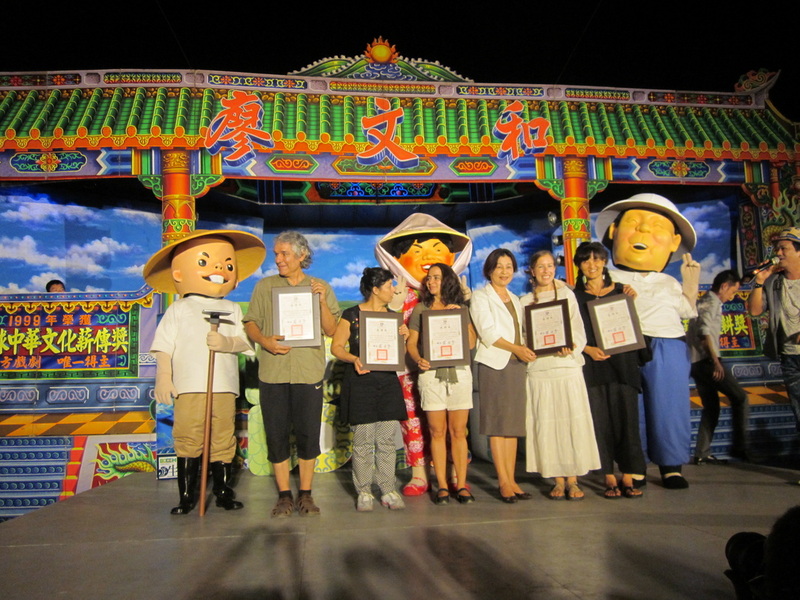 The International Festival of Puppet Theater Jerusalem is produced by The Train Theater. The Theater was established in 1981 as a collaboration of four independent puppeteers: Michael Schuster, Alina Ashbel, Hadass Ophrat and Mario Kotliar. At first, the performances took place in a train wagon brought to the Koret Liberty Bell Park for that purpose. As the years passed it became a creative and inspirational source of puppetry in Israel. This year they celebrate their 30thanniversary as a company and their 25thpuppetry festival. 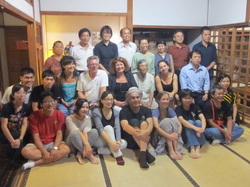 The Puppetry Festival invited performers, produces and directors of festivals from nine different countries and they produced thirty-eight shows in six days. There were ten shows for adults and the rest were for children and family from ages two and up. It was a great opportunity to have so many producers and festival directors from all over the world to see our work. We were very happy to hear that the theme for this year’s festival was paper. 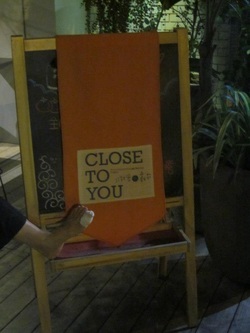 The artists used the art form of pop up book, paper cut, paper folding, paper silhouette and more to create their shows. photographer of the festival said it was one of the best shows he had seen at the festival. The children were so lucky to have the opportunity to be exposed to so many different shows at the festival! Even though each show incorporated puppetry, there was a huge variety. Some of the shows connected to poetry and literature, some were folk tales, others were light hearted and fun and there were three walking tours. It was evident that they put just as much effort into the children’s shows as they did for the adults. They hold the children with great respect, and it is no doubt that an excellent children’s show is not just enjoyed by children, but by everyone. inspiring city as Jerusalem. This festival has allowed a space for inspiring dialogue and a cultural bridge between the local artist and colleagues from abroad. day in Holland we all were working like mad on our final project/performance. the world cup? Who knows. We have a little ways to go! drinking wine. I think the most painful goodbye was to my Taiwanese companions. 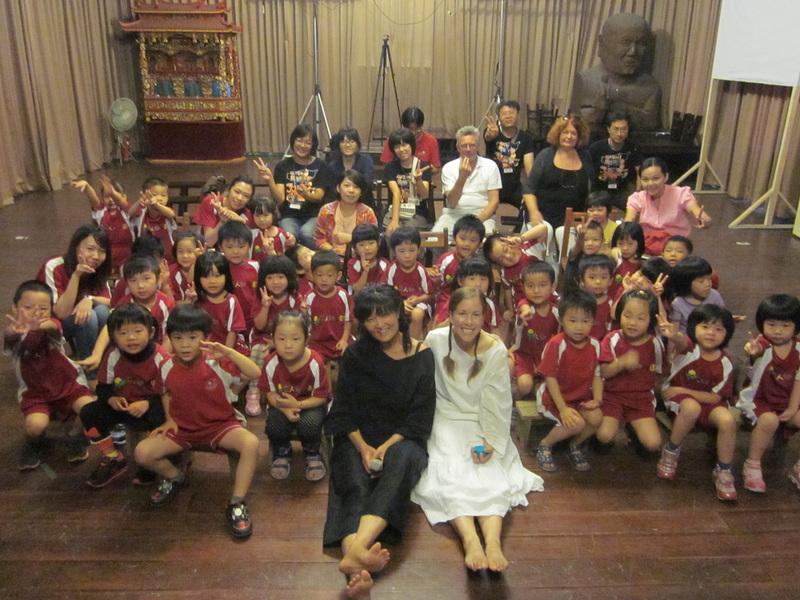 learned more Chinese than Dutch, and singing, dancing and laughing constantly. without even saying anything at all. I think my companions called that Ashi. in your own creative mind. It truly is inspiring. There is so much to share. be working with flashlights! Oh my goodness. I am officially a shadow nerd! performance. I think we both felt proud of our work. birthdays. Taiwanese people age so well. I thought she was at the oldest 30.
won their game in the World CUP! Hooray for Holland! in the living room section. An audience of about 35 sees 3 shows in one night. between shows. It is going to be a whirl wind of a night. We have been rehearsing every day. The house where we are staying has turned into a studio. a lot of brain power, but it is worth it! four wonderfully energetic Taiwanese. I love listening to them speak Chinese! and laugh together. My kind of companions. so so much cheese! I am in heaven. Cheese for breakfast, lunch and dinner! What could be better? "Spica, I have to pinch myself every day to make sure this experience is real." year. Look out year...here I come! ask for anything better! I am truly on cloud nine! Much more to come!